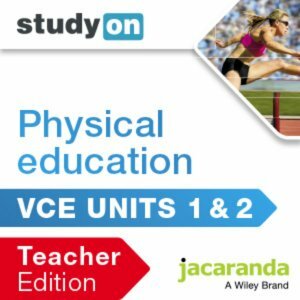 studyON VCE Physical Education Units 1 and 2 Teacher Edition (Online Purchase) provides a comprehensive coverage of the new VCAA study design for 2017-2021. This is the teachers’ portal: a powerful diagnostic tool that enables teachers to track and assign activities, plus monitor student progress at an individual, group or whole class level for immediate insight. studyON VCE Physical Education Units 1 and 2 Teacher Edition creates new opportunities for teachers to help their students to improve their VCE exam results by implementing independent study, revision and exam practice in Year 11. • Report on student progress and generate and schedule reports.